In 2008 the Bristol-based renewable energy developer, Marine Current Turbines (MTC), installed the world’s first grid-connected tidal stream turbine in the waters of Strangford Lough on the eastern coast of Northern Ireland. Known as SeaGen S and capable of generating up to 1.2 GW of electricity from the kinetic energy of the Lough’s fast-flowing tidal currents, the device represented a significant step forward in the development of commercially-viable tidal power technologies. The recent near-collapse of MCT following the decision of Siemens, their owners, to sever their connection with the wave and tidal energy industry, served, however, as a reminder of just how much still needs to be achieved before tidal stream and tidal range devices start to receive the same level of investment and support as that enjoyed by other, more prolific renewable energy initiatives like wind and solar. Nonetheless, SeaGen remains in situ, its blades rotating in unison with the twice daily rise and fall of the tide and, thanks to a 24 hour monitoring system, continuing to generate power with minimal adverse impacts on nearby marine fauna. Furthermore, with the recent announcement that Atlantis, another wave and tidal energy company, is to throw MCT a lifeline, the future of tidal power in the Lough would appear to be secure. A rare tale of success, which stands in stark contrast to the on-going saga of failed enterprises in the Severn Estuary. 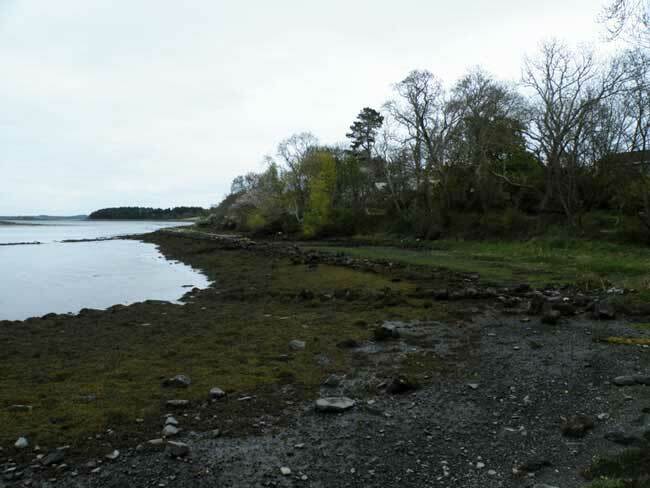 Interest in the potential inherent in the tidal cycle of Strangford, and other similar environments around the coast of the British Isles, is, however, nothing new, with the achievements of the SeaGen device reflecting similar trends dating back more than a thousand years. In 1999 excavations at the site of Nendrum Monastery on Magee Island, the largest such landmass in Strangford Lough, resulted in the re-interpretation of linear wall structures in the waters to the east of the monastic complex as mill dams, rather than fish weirs as had hitherto been believed. Over subsequent seasons of fieldwork, the well-preserved remains of three successive phases of milling activity were revealed, with dendrochronological dating providing confirmation that this was the site of the earliest example of a tide mill in the world. The first mill was shown to have been constructed between AD 619 and AD 621 and comprised a large dam, 110m in length, which served to impound water within a triangular millpond, 6,500 m2. The pond would fill at high tide and be retained as the tide receded outside the embankment, thereby providing a source of motive power to drive a horizontal waterwheel as it was released back into the Lough. This wheel would have been located in a wheelhouse positioned at the southern corner of the millpond. In the late 7th or early 8th century the first mill fell out of use and was replaced by a second complex of features on the same spot. The most marked change was a reduction in the size of the mill pond, with a new dam forming a smaller, rectangular area of impounded water adjacent to the shore. This was then largely destroyed by the final imposition of a third mill, again in the same location and dating to the end of the 8th century AD. Alongside a wealth of stone and waterlogged wooden artefacts, including a variety of stone slabs marked with crosses, the excavations yielded the almost intact upper millstone from this later development. Within the remarkably extensive literature on the history and archaeology of tide mills and early water mills, Nendrum has since become an icon of this site-type. 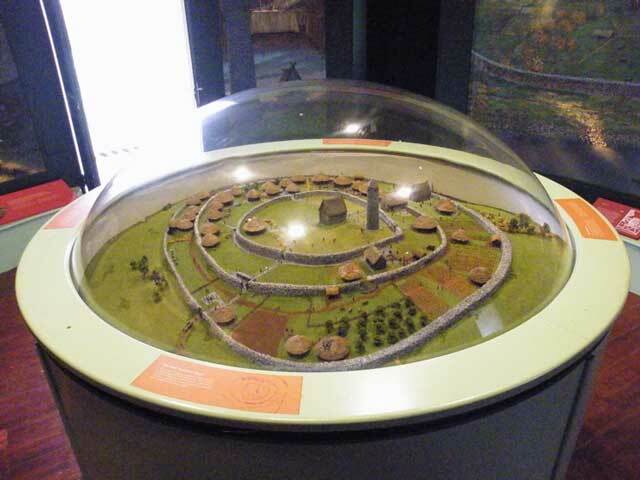 Further fieldwork in Ireland is increasingly revealing just how commonplace such structures were in the early medieval period but, at present at least, Nendrum would appear to be where it all began. With my own interest in the recent and much deeper history of the interactions between humans and the non-human process of the tidal cycle, Nendrum has long been a source of some fascination and it was thus with great anticipation that I finally arrived there on a bleak and blustery day in late April. Despite the unseasonal weather conditions and the overcast leaden skies, the atmosphere of the place was tangible and it was a thrill to see the still imposing remnants of the mill pond walls in person. Thankfully a respite from the cold was provided by a superb, if somewhat modest, visitor centre which included a balanced array of written information, artefacts excavated from the site itself, interpretative reconstruction illustrations, a model of the site and an engaging, if rather dated, television documentary (great for someone nostalgic for the 90s, but otherwise in need of updating!). In many respects this is the real antecedent of the ill-fated Severn Barrage. Whilst recent proponents of tidal range technology frequently tout it as an advanced technology of the future, a means by which to harness an apparently un-tapped source of endless and predictable energy, and an alternative to “old-fashioned” or “out-dated” forms of electricity generation like coal and nuclear, in reality it is nothing of the sorts. Its origins lie in the ingenuity and hard work of people living centuries earlier driven both by their need to extract power from whatever sources were available and their devotion to a power somewhat more intangible. Their lives seem almost impossible to comprehend in the fast-paced, digital age in which we now live, being bound up with cycles of day and night, ebb and flood that have long since been rendered obsolete through modern innovations. Nonetheless, with the recent proposals for a tidal lagoon near Swansea Bay only one step away from receiving government consent, it may soon come to pass that the tidal cycle regains some of its former importance as a source of power and sustenance at the heart of our own society. N.B. For those interested in reading in far greater detail about the excavations at the Nendrum tide mills, a comprehensive archaeological monograph is available: T. McErlean, T. & N. Crothers, Harnessing the Tides: The Early Medieval Tide Mills at Nendrum Monastery, Strangford Lough (London: The Stationery Office, 2007). Keenan, G., et al. “SeaGen Environmental Monitoring Programme Final Report.” Royal Haskoning: Edinburgh, UK, January (2011). McErlean, T.C. et al, ‘The Sequence of Early Christian Period Horizontal Tide Mills at Nendrum Monastery: An Interim Statement,’ Historical Archaeology, 41:3 (2007), 63 – 75.